Performance Time: Approximately 30 minutes, 25 pgs. SCI FI/HORROR. 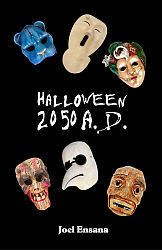 In this post-apocalyptic world, all the birds have died, foul-smelling foam bubbles up from water adorned with strange jewel-like rocks, and more and more people have to conceal their faces with masks, especially the children, as their horrific faces have the “look of the future.” It’s Halloween and a mother and her two children arrive on the doorstep of an old woman’s home. Until now, the old woman has survived by hiding inside her home with the curtains drawn and never touching anything or anyone outside her home. But with it being Halloween, the old woman opens her door to the trick-or-treaters and offers them a few pieces of stale candy and a couple of pennies she has saved in a jar. Once inside, the mother and her children discover the old woman’s comfortable, spacious home and can’t believe their eyes. In this new world, the government has seized private property, and families are forced to share cramped quarters with strangers in public housing. Spying an opportunity to improve their lives, the family threatens the old woman: either let them live there or they will take off their masks and report her to the government. Audiences will be captivated by this suspenseful, spell-binding play. Joel Ensana has published several plays and more than 60 short stories. Mr. Ensana is a former playwright in residence at San Francisco State University and has won numerous awards for his writing. Originally from New Brunswick, NJ, he now resides in Santa Fe, NM.